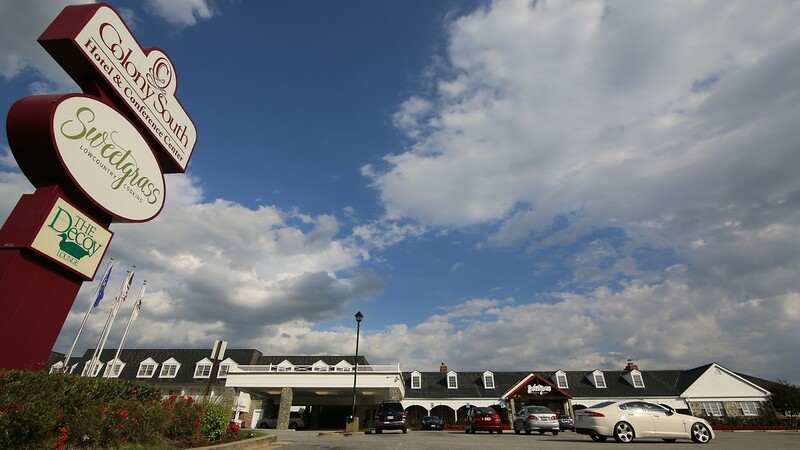 Located in Clinton, Maryland, Colony South Hotel & Conference Center provides military and leisure travelers with an impeccable blend of traditional style and contemporary lifestyle amenities. Whether you are visiting for a family vacation or a business meeting, our Washington, DC area hotel is a welcoming retreat for relaxing, working, connecting and dining near Americas capital city. Colony South Hotel & Conference Center Presents Live Entertainment in The Decoy Lounge. Unwind in our newly-renovated guest rooms and suites outfitted with plush beds, 42" LCD TVs, desks, telephones with voice mail and room service. Get energized in our state-of-the-art Fitness Center with a heated indoor pool, and sauna, or hit the tennis and racquet ball courts. And you are always connected with free Wi-Fi and the business center. Enjoy delicious Continental Cuisine at Sweet Grass Low Country Cooking, grab classic American eats at the Café5 and kick back with cocktails and music at Decoy Lounge. Meet and motivate in our high-tech Conference Center with 10,000 square feet of dynamic event space and our elegant ballroom for meetings, receptions, trade shows and wedding celebrations. Offers an ideal location for your wedding Ceremony, Reception, and Lodging Needs whether it's an Anniversary Celebration, Bridal Shower, or Rehearsal Dinner, We Will Do More for You! We know it's the day you've been dreaming of your whole life and the once-in-a-lifetime event that will live in your heart and mind forever. Let the experienced staff at Colony South Hotel and Conference Center make it an occasion that you and your guests will never forget. For a quote of our wedding design & planning services, we ask that you please complete the Request For Proposal form. Explore the historic neighborhood of Old Town Alexandria, including King Street shopping and the historic Christ Church. "Every time I have stayed here the room be great smells good, clean, and the staff been great. Reasonable rooms." "Each time I come to stay at Colony South, it is a great experience. Very clean, food accessible and friendly professional front desk hospitality. My go to when I visit Maryland. for me it's home away from home. Thank you Colony South." "I must admit this most recent stay was a much better experience than the time before. I have stayed at Colony South on numerous occasions over the years, and I can see that they are improving and expanding in what they have to offer. I give the Front Desk Representative (DAVID) my greatest thanks and appreciation for making my stay an enjoyable one by providing exceptional service in a conscious effort to accommodate my reservation. David. . . because of you, Colony South gets Five (5) Stars." "The stay, room were awesome, loved it very much, next time we go to Baltimore we will stay here at Colony South , we enjoyed it very much. Betty Ramos"